Last call for Retiring List Contest, etc! - I'll begin my Holiday Countdown on December 1, where I'll post a different project each day on this blog, all the way until New Years. - Stampin' Up! 's new "Spring-Summer 2008 Collection" Preview catalogue will be available for viewing... get some sneak peeks on what's coming soon. if you're in Canada, why not preorder your new catalogue through me and have it in your hot litte hands come January. Contact me to learn how you can get it + a coupon off your first order! - More classes! We have 3 Stampers Club nights, a Holiday 10 card camp, a Star Book class, a Holiday Tag making night, and a Children's stamp camp during the winter school break (loads of fun with the little ones). These are the 5 projects we're making at tonight's "Baroque Motifs" class: 4 cards and a candle. Please click on images to enlarge -- enjoy! My lovely daughter Serena turned 10 years old today! I managed to sneak this shot of her with a hot chocolate at lunch time yesterday. I think it perfectly captures her in her "pensive" moods... one of the thousands of moods any pre-teen is liable to have! You still have time to take advantage the Serena Birthday special, and get 10% off your order (plus free S&H). All the deets can be found HERE! Recent "Canadians, INK!" Group meeting! Here are some pics of cards from last Friday's team meeting at my studio, plus some other fun pics I just needed to share too. Extra SPECIAL thanks to Carol for bringing her newest stamper-in-training, Courtney. I apologize to everyone for trying to monopolize her. Actually, I take that back -- I *don't* apologize for being greedy and wanting some sweet baby-time... so deal with it. These are the two Make & Take's I set up from everyone to do. The first one uses the new "Time Well Spent" Level 3 Hostess set that will be in the new "Spring-Summer 2008 Collection"... all active demos got one free as a surpise "We Love You" gift from Stampin' Up!. Ahhh... I love them too. ETA: Just found it: I got the idea for the flower in pink on black from April Roycroft. The second card is from the "A Beautiful Thing" set I received at Founders Circle in September. It too will be in the new catalogue, and for once I think I actually designed a card myself. Heavens to Murgatroyd, that doesn't happen very often! The following are some of the cards given to me at the meeting (I'm such a luck duck) to add to my sample wall! Aren't they all so stinking talented???!!! :) Why not leave me a comment if you think the answer is yes! p.s. To all "Canadians, INK!" demonstrators, the group blog has a new address: team.canadiansink.ca. If you are experiencing difficulties logging in, please contact me! To celebrate my beautiful daughter Serena's 10 year old birthday on Monday, I am offering 10% OFF your entire order as well as FREE SHIPPING*, from now until 6pm on Monday November 26! If you don't have a copy of the current "Fall-Winter 2007 Collection" or the Holiday Mini, links to both can be found on the right-side. To take advantage of this deal, just say "I saw it on your blog".... so call or email me by Monday night to save BIG! Presenting Emily... a future stamper for sure. 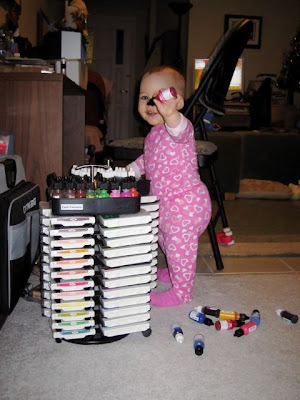 Her dad Rob emailed me this picture of her getting into his stamping supplies. Silly bunny! You'd better hope that her fine-motor skills aren't such yet that she opens up all those reinkers and gets them on the carpet, Rob... Dawn will have your head on a platter is she does! Isn't she a cutie pie??? If she's anything like my Serena, she's in for a lifelong love affair with the craft! "Wrapping Up the Holidays" Promotion! Here are the details on this promotion, valid from November 23 until December 15, ONLY WHILE SUPPLIES LAST! Purely Pomegranate (item 109863) and Chocolate Chip (item 109862) Satin Ribbon*: Buy 1, get 1 free! For a full colour flyer with details, please click HERE! ... today's cards are all suitable to give to the guys in your life! Nothing girly-girl here -- instead, you'll find flannel and cloth textures, browns & greens, natural wildlife and fun-loving monkeys, hardware and tools (love my Crop-a-dile). These are just 3 of the 5 cards we're making at Tuesday's Masculine Card Camp, from 7-9pm. The cost is $19.95 per person or FREE with a $60 order placed that night, and includes the 5 cards, envelopes and supply list cheat sheet. "Canadians, INK!" team demonstrators and Stampers Club members pay only $14.95! Please RSVP if you would like to attend. Retiring List Contest = FREE STAMPS! Hard to believe that it's that time of the year again, but Stampin' Up! 's retiring list for the Fall/Winter 2007 Collection us being released on December 1. So it means it's time for another one of my great contests!!!! 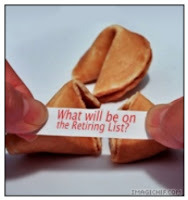 Email me with your top 15 guesses of stamp sets that you think will retire, no later than 6pm ET on Friday November 30th. The person with the most correct guesses will win their choice of any one retiring stamp set from my personal collection. Cool, eh? My end-of-month newsletter gets mailed out tomorrow so be sure to sign up now to get it delivered to your inbox! You'll get the scoop about the new "Spring-Summer Collection 2008" catalogue pre-orders, the new Angel Policy, and a sneak peek at what else is coming next! You may have noticed my recent use of a watermark on some of my images... this is something I'd been meaning to get around to doing for a while but hey, was kind of low on the totom pole as far as priorities go, ya know? Anyhow, someone pointed out Beth Silaika's work at Freckled Fun Designs and I fell madly in love with her circular design. I can't emphasize enough whata pleasure it was to work with her to create my own. She's a peach, she's likety-quick and she's affordable. Got to love it! 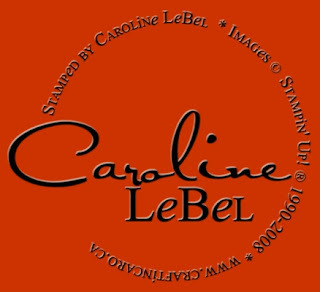 So if you're in need of a watermark or some banner work for your blog, go on and visit her, and please tell her I said hi! Card Tote a la "Darling Doodles"
Here's a little preview for you of this Thursday's "Fast & Fun Notes" Stamp-A-Stack, but not of the cards we're making.. no, no, no. Nope, this is the matching card tote we'll also create, that fits all 8 cards & matching envelopes snug as a bug. Ain't it adorable? Just click on the image if you would like to see it enlarged and in greater detail. If you behave (and Santy Caroline knows if you've been bad or good), I'll also post the cards tomorrow morning. So be good! All the info about my classes and events can be found on my Events page (or you can always follow the link down the left-side of my blog). I have room available for Thursday's class plus Saturday's 10 Holiday Card Camp if you need to get ready with your Christmas cards. If you're in Toronto or the local area, why not RSVP a spot and check it out? Fun, stamping & chocolate for all! I've received some "cool beans" mail recently, and want to share about it with you, my Constant Readers. One of the packages was my long-anticipated 5 year pin & letter from Stampin' Up! Yes, my demonstratorship is now in its 6th year and I'm lovin' it more than ever. I sure didn't know what I was getting myself into, yet I wouldn't change a thing! When I joined back in spring of 2002, it was with no more of a "plan" than to be able to get the Starter kit at an awesome price and MAYBE sell to a few friends to stay active. My never-ending thanks now & forever to Anna Monte for convincing me to sign up that night! 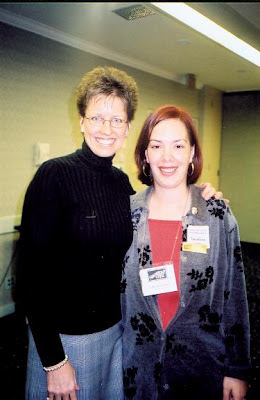 Here's a picture of me with our Co-founder and CEO Shelli Gardner from back in 2002; I figured it's worth a giggle or two. Why am I getting it? 'Cuz SU ****loves**** me, that's why. Okay, they also love ALL the other demonstrators out there, since they're sending on to all of us! Yippee!!!! If you have ever wondered, dreamed about, considered, pondered, contemplated or just plain were curious about Stampin' Up! as a business, why not come to my free Information Night on Wednesday the 14th? Take an hour to have all your burining questions answered, why not? I'll show you what's in the Starter Kit, show how its customizable to YOUR needs, and we'll have some fun (and chocolate, too. Always chocolate!). If you're in Toronto and want to RSVP, go for it -- I'd love to chat with you. If you're somewhere else in Canada and just want me to mail the information to you, that's cool too. Pretty Girls & Their Bows! Here are a few more bows made by some of my Stampers Club gals (Catherine, Ann & Krista) -- don't they look like they're having fun? Or maybe they've been sniffing the Crystal Effects a little too long, hmmmm. Either way, making gorgeous customized paper bows using our Designer Series papers is fun and easy, once you've tried it out. If you'd like to see a step-by-step tutorial on how to make these, visit this Splitcoaststampers page. I'll be making these as one of our Make & Take's at all my November hostess workshops this month, so contact me if you'd like to book a date to play! How to Keep your Christmas Gift Secret! 2 - Why not get your spouse/SO to give you what YOU really want this year, rather than risk him making you something totally wacky? Ask for some yummy Stampin' Up! goodies this year! Take advantage of my Wishlist service (especially during November's free S&H promotion) and I'll do the rest of the work. It doesn't matter if you don't live in Toronto... UPS ships anywhere in Canada, and you can always ask for a Gift Certificate to use with the new catalogue if you prefer. As crafters, we pride ourselves on making beautiful hand-crafted items to give as gifts. I've made & given numerous bragbooks, scrapbooks, card ensembles, stamped candles, holiday cards and stationary... you name it. My Corel Photo-Paint is acting up today, so you'll have to wait to see some more samples until TechnoGeek takes a look at it, so stay tuned.